The final frame from Ayrton Senna's fatal crash. Arguably one of the greatest racing drivers of all time, Ayrton Senna, crashed during the 1994 Formula One San Marino Grand Prix, held in Imola on 1 May 1994. He crashed into the Tamburello corner at the Autodromo Enzo e Dino Ferrari, whilst driving his Williams FW16. The accident, which was broadcast around the world on live television, had occurred on the seventh lap of the race. Senna's car left the racing line at 190 mph, ran in a straight line off the track and struck an unprotected concrete barrier. The right front wheel shot up upon impact and entered the cockpit, striking the right frontal area of Senna's helmet. He was more or less killed instantly, but remained on life support for many hours afterward due to Italian law. Senna's death was considered by many of his Brazilian fans to be a national tragedy, and the Brazilian government declared three days of national mourning. For many years the Williams F1 team remained entangled in Italian criminal court proceedings. The reason behind the accident has never been fully understood, with a wide range of theories from a broken steering column - which had been made longer at Senna's request by welding an extra piece onto it ahead of the race - to low tyre pressures due to a long period behind the safety car.Many believe however that the steering column, which had been quickly modified as there was not enough time to manufacture a longer steering shaft, broke, causing Senna to veer off the track. Footage of the final lap from Senna's on-board camera cuts out before his car hits the wall, and the footage showing the accident itself has never been officially released. According to the Senna Files website, the in-car footage transmitted from Senna's car was supplied by the Formula One Constructors Association (FOCA) to Williams Grand Prix Engineering in May 1994. Around the time of the crash, Formula One boss Bernie Ecclestone was quoted as saying that Senna's in-car camera footage had been delivered to Frank Williams, head of the Williams team just two days after the event. During the legal proceedings Maurizio Passarini, the chief prosecutor in the Senna manslaughter trial, stated that he had requested this footage on the 9 May 1994, but the FOCA representatives understood the request as 'shots of the impact', which they stated did not exist and as such the request was not honored. The videotape was finally received by the Italian authorities on 9 September 1996, and the image above was the last frame shown before the footage cuts to static. The existence of a videotape containing the on-board footage was discovered by Brazilian journalist and reporter, Roberto Cabrini, and this tape was subsequently broadcast on Brazil's Rede Globo television network. In this version, the footage shown ended 12.8 seconds into Senna's fatal lap. The data from the car's computer is said to have indicated that the crash had occurred at 14.2 seconds, meaning 1.4 seconds of footage leading up to the crash were missing. The video eventually viewed in the courtroom showed a gap of 0.9 seconds. The FOCA claimed that the film cut out because their television director had decided to cut to another shot. An analysis of the on-board camera video was submitted by the non-profit consortium Cineca, which tracked the movement of the steering wheel during the race. Having rotated in a fixed arc during the previous laps, during the final seconds a yellow button on the wheel moved several centimeters away from its normal trajectory, with the steering wheel tilting in its own plane, indicating a breaking steering column. The FOCA employees who were manning the control truck during the race were director Alan Woolard, producer Eddie Baker, and video switcher Andy James. During the hearing they argued that it was a pure coincidence that the videotape had ended just prior to the fatal crash, as the decision to switch the camera shot coming from Senna's car to that of Japanese driver Ukyo Katayama was taken approximately ten seconds before the accident, as Senna was leading the race and there was nothing of interest ahead of him. 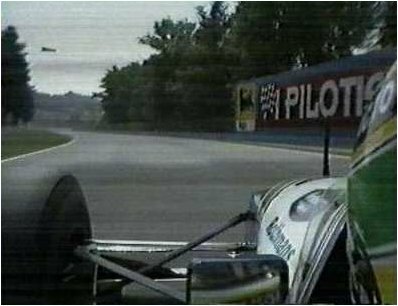 The next shot on the tape supplied however was from Gerhard Berger's car and not Katayama's, which too showed an empty track. When questioned about this further, the employees stated that a wrong button had mistakenly been pressed, resulting in images from the camera mounted on Berger's car being selected. This action caused some fourteen seconds of interference and resulted in indistinct pictures between the last shot from Senna's camera and the first from Katayama's. The on-board footage of Senna's final lap prior to the crash was released in December 1994 as part of Duke Video's Formula 1 World Championship review. The footage prior to the crash was again included in the 2010 film, Senna. In both instances the footage of the crash was not included and is now believed to be lost forever. The most commonly seen footage of the accident was that which was broadcast live at the time from two television cameras, one of these being located before Villeneuve Curve pointed towards the Tamburello Corner and another fixed to a helicopter providing an aerial shot. These two cameras were mainly the ones used during the live broadcasts and the footage has been shown many times since. Despite the fact that there were many handheld cameras (not including amateur recordings) filming the circuit that day, as well as there being another television camera located on the corner of Tamburello, their footage has never been released to the public. Some handheld camera footage of the accident does exist, as a brief clip of this was shown during a news report broadcast on the tenth anniversary of the Brazilian's death, by the television channel France 3. Around 37 seconds into this report, a brief shot of the efforts of paramedics was shown, clearly recorded from a handheld camera which has seldom been seen before or since. It is unclear what footage does exist of the accident, however whatever does exist is most likely being held under lock and key by Formula One Management (FOM). The aforementioned France 3 news report, showing the rare handheld camera footage 37 seconds in. Ayrton Senna's Last Lap - Imola 1994 (Video analysis by CINECA and enhanced by Imola94Research). Ayrton Senna's Last Lap - Imola 1994.